Happy Friday!! Hope you all have had a wonderful week and are looking forward to an even better weekend. Today I’m off to Prague, the last leg of my travels with my friend Katherine! I’ve never been to Prague before, so there’s a lot we’re going to try to fit in and do while we’re here. If you have any recs on things we MUST do or see before we leave, comment below or write me an email! The chilly London summer has had me reaching for my jeans and a light jacket nearly every day I’ve been over here. I re-wore this look to high tea at Sketch last week, and have to admit I was pretty happy to be matching all the decor. 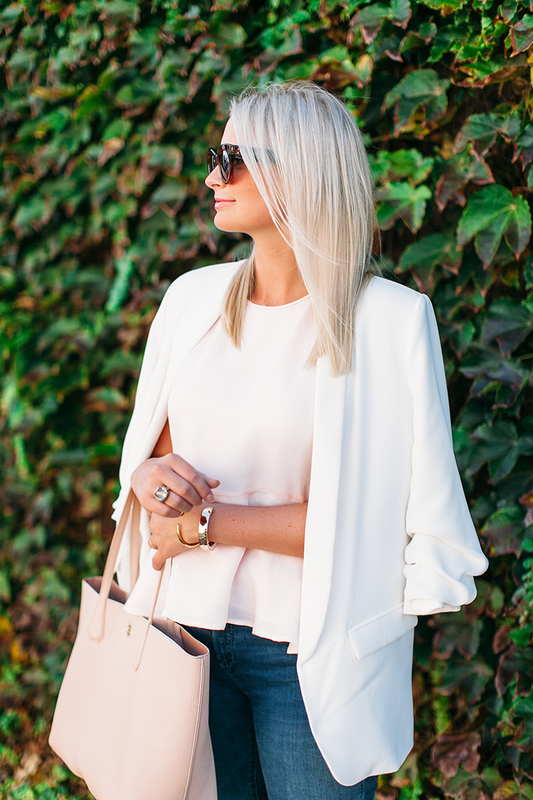 Seeing how much I love blush, I bet you’re not surprised that I snatched up this top from Club Monaco! The slight peplum and flowy look create a darling silhouette, don’t you think? The higher neckline makes this top an ideal item for work – just top it with a light jacket! I’ve also gotten so much use out of this Tory Burch tote I picked up earlier this summer. It’s the perfect size, and the leather is so lightweight and pliable which makes it super easy to pack. I highly recommend picking it up in one of the new colors for fall – perhaps in black, cognac or oxblood? It’s a wardrobe essential! 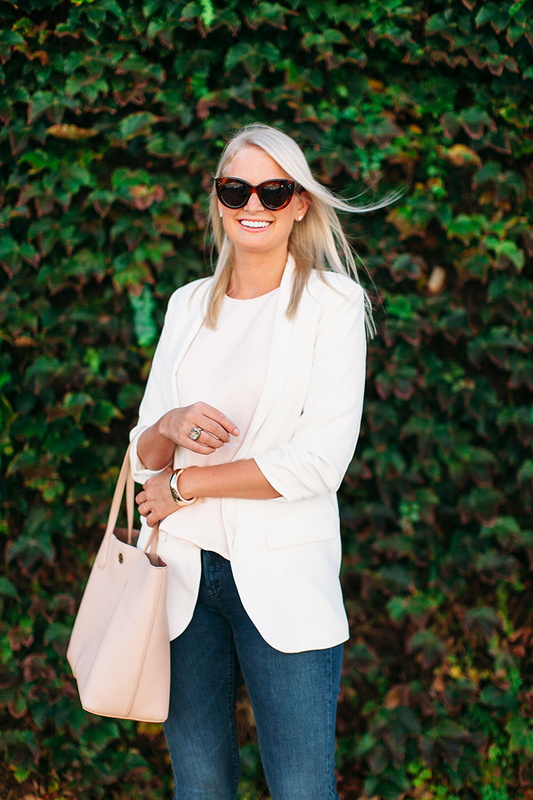 Simple & chic – I love that the sleeves are already scrunched on that blazer, since I do that to almost all of mine anyway…genius! Have fun in Prague! I’ve loved following along your fab travel agenda!! 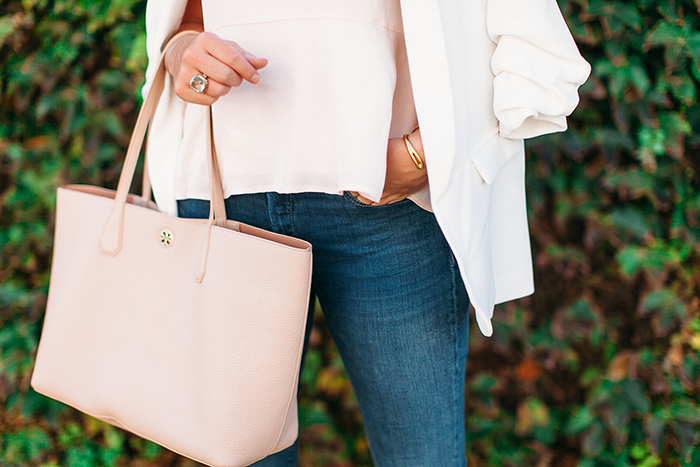 Love this blush peplum! So cute! Have a great weekend in Prague! I love this look and your hair color is gorgeous. Have fun!! If you have time, you should eat at School restaurant & lounge in Prague. It was my favorite meal in the city and it has beautiful views of the river! Love that soft peplum and those sandals are great! 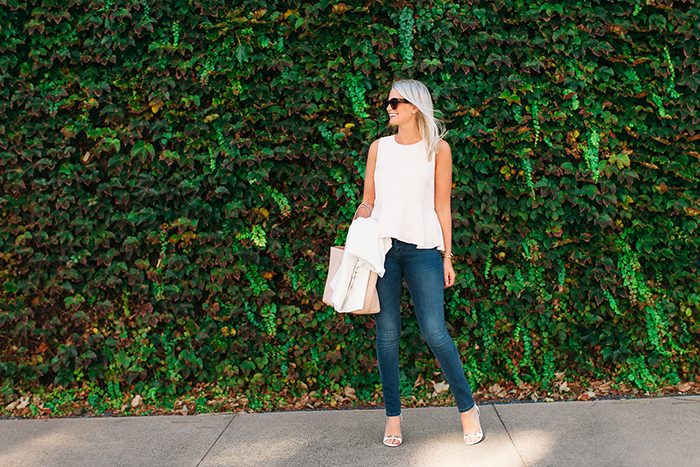 Jeans, heels and a peplum top is one of my favorite combinations!